THE SILVER-HAIRED MIC-WIELDER was king of the ITV nighttime schedules even before they went 24-hour. Not much to report, except he was always on your television when you rolled in from the pub at 11:30. 80s Springer, perhaps, but a) with 30 years more experience than Springer, and b) with bags more tact and bags less sensationalism than Springer. Retired in 1996 after notching up those 30 (count ’em!) years of audience/guest interaction. In 2002, Donahue attempted a comeback on one of the fifty million American news channels, but he had the misfortune of going on opposite the Evil Overlord of Opinion himself, Bill O’Reilly. 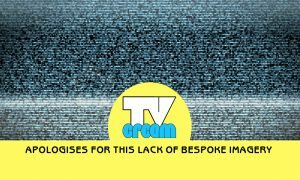 Phil’s viewership this time around was so miserable that in the inevitable Saturday Night Live parody, one of his sponsors was This Space Available, Call For Rates. 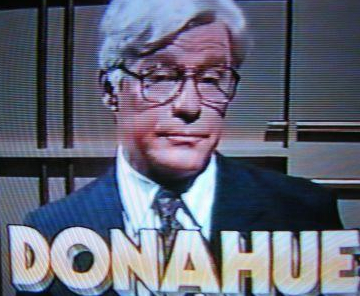 Isn’t that a photo of the late, great Phil Hartman “doing” Donahue on SNL, rather than Phil himself? As well as being a proto-Springer, it’s also perhaps not unfair to say that without him there would have been no trail blazed for the Big O (Oprah, not Roy Orbison). @EricW, to add to that, his show on MSNBC garnered the lowest Nielsen rating ever, a 0.1, which meant about 1,500 or so people were watching his show. I remember reading somewhere, that he actually met his current wife on the show where she was a guest!! Not seen this though it was fun to see Lesley Neilson pretending to be PD in The Naked Gun 33 1/3.